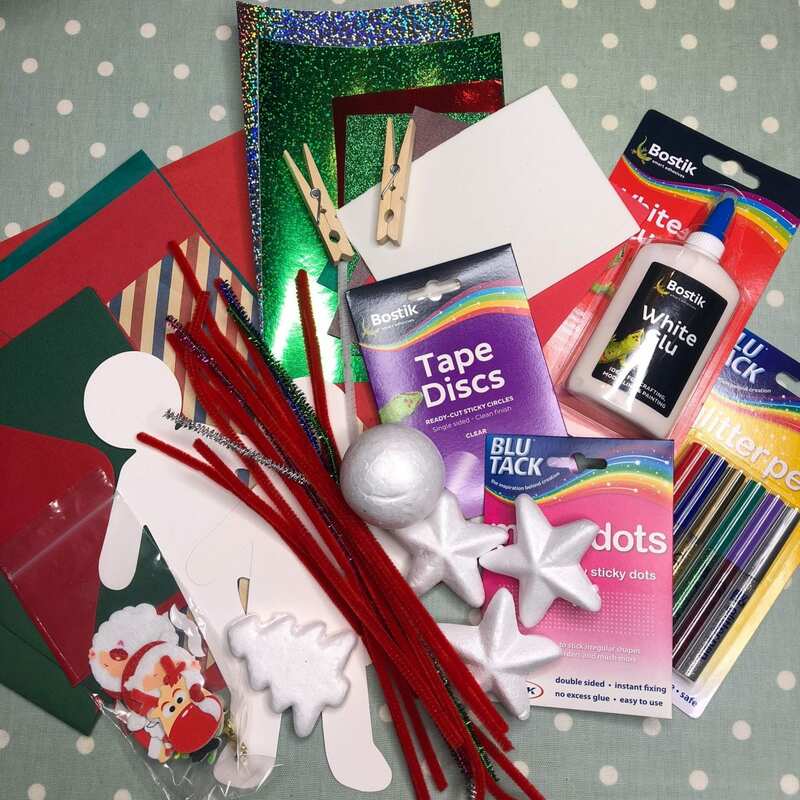 As part of our role as a Bostik Blogger each month we are sent a box of crafty goodies to inspire us, and this month’s topic not surprisingly is all things Christmas! Previous years in the run up to Christmas we have made Christmas cards, Christmas stockings , pine cone reindeer and snow globes. This year we are concentrating mainly on making Christmas tree decorations. I have always wanted to have a tree full of hand made decorations and this year it might just happen. OK it might be the little tree upstairs on the landing, but it’s going to happen never the less. 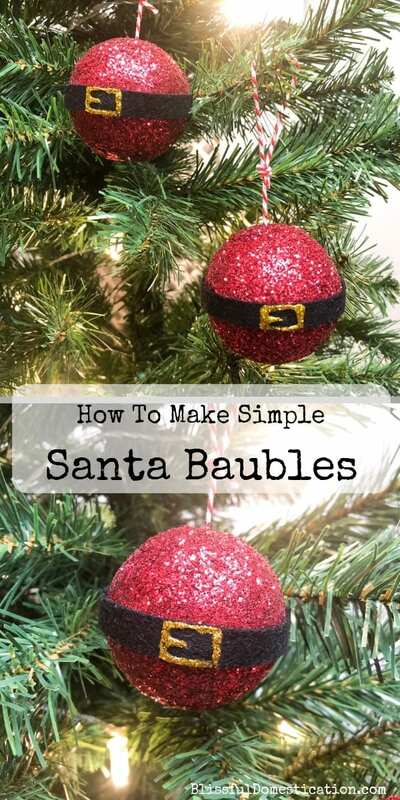 So, the first Christmas tree decoration we have made are these super Simple Santa Baubles. 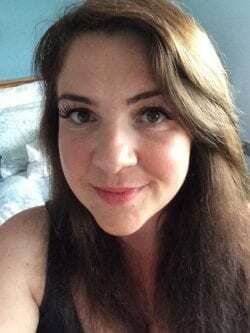 Warning, if you are glitter phobic then this probably isn’t the craft for you! However, if you’d like to see how we made them read on, or pin it for later! 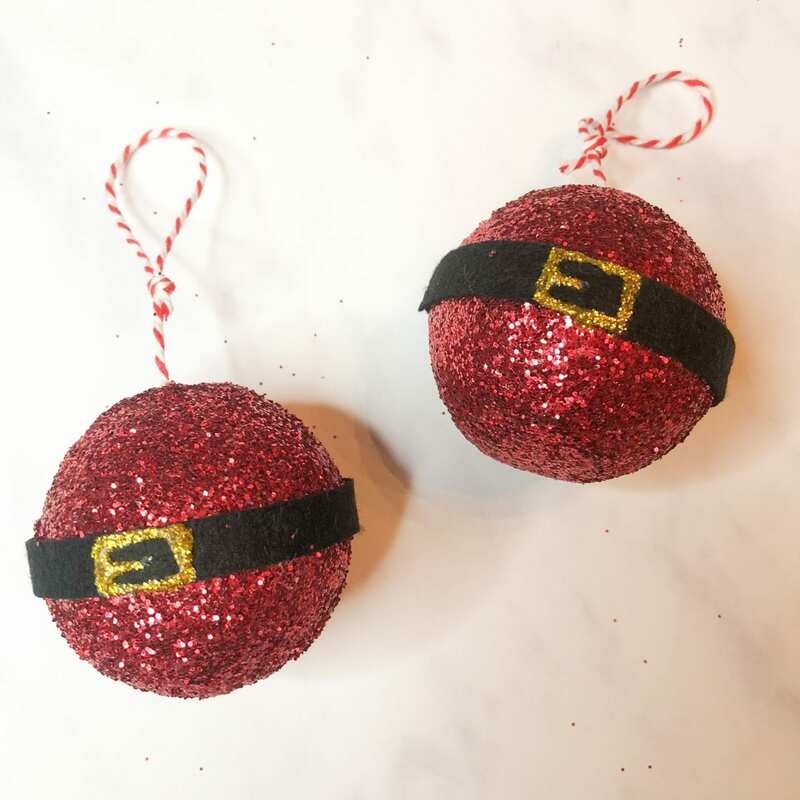 Pin the ‘Simple Santa Baubles’ for Later! First you need to make a hole through the centre of the polysterene ball. This step is strictly adults only! I used a wooden skewer, but you could also use a screwdriver. 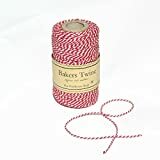 I then used an embroidery needle to pass some bakers twine through the hole in the ball. 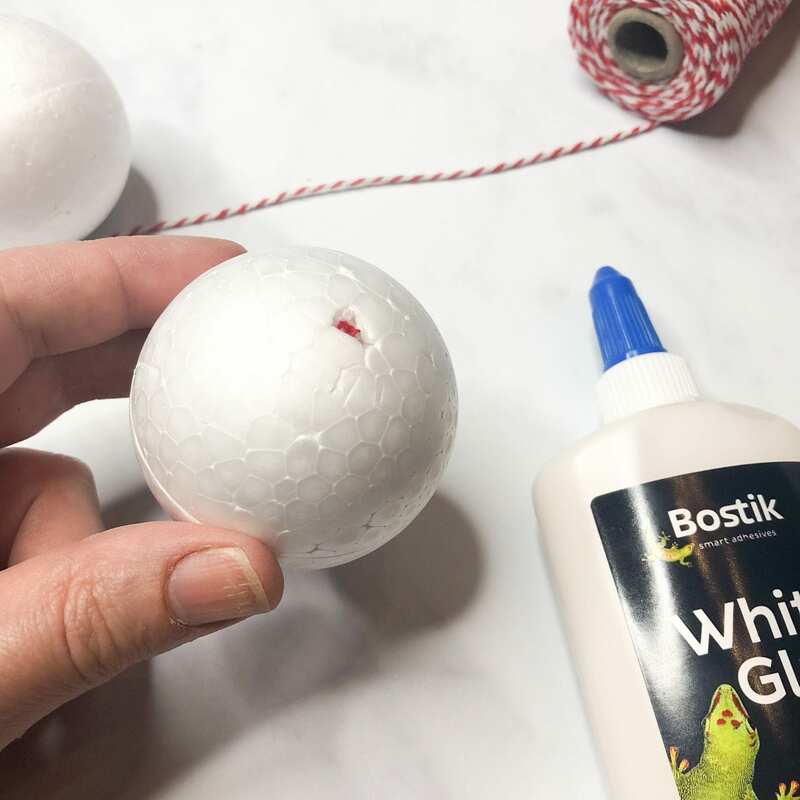 Knot the bakers twine at one end and push into the polystrene ball so it’s flush and apply a blob of Bostik White Glu on it to secure. 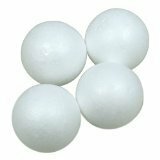 Then apply Bostik White Glu to the whole surface of the polysterene ball. I found the easiest way to do this (especially for the kids) was to pour some into a cup and apply it with a paint brush. 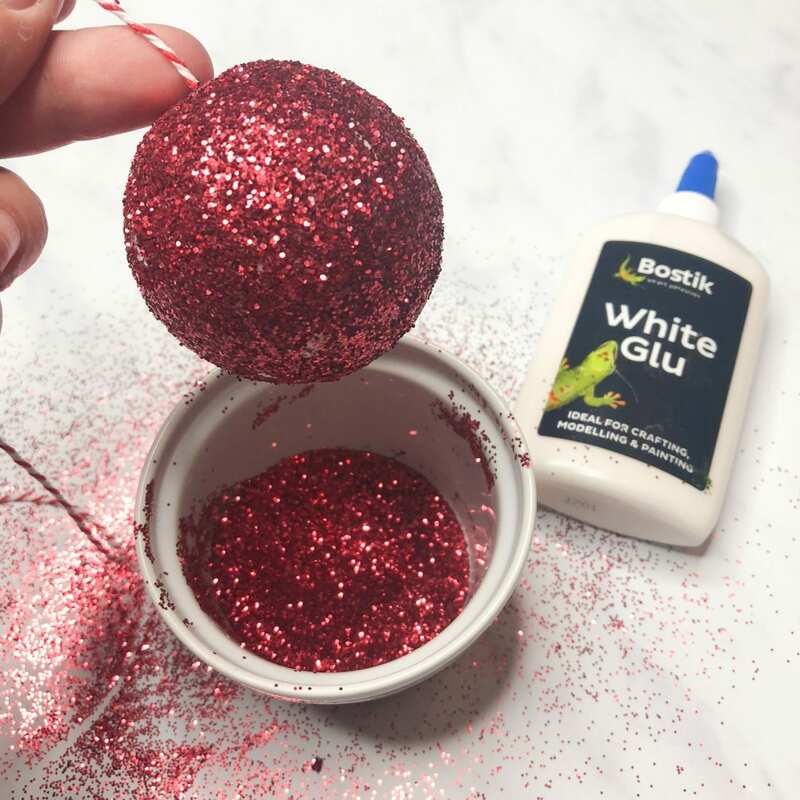 Once covered in glue add red glitter to the whole surface, using the string to hold the bauble. When it is all covered hang somewhere to dry. You may find when it is dry that there are some small areas of exposed polysterene. 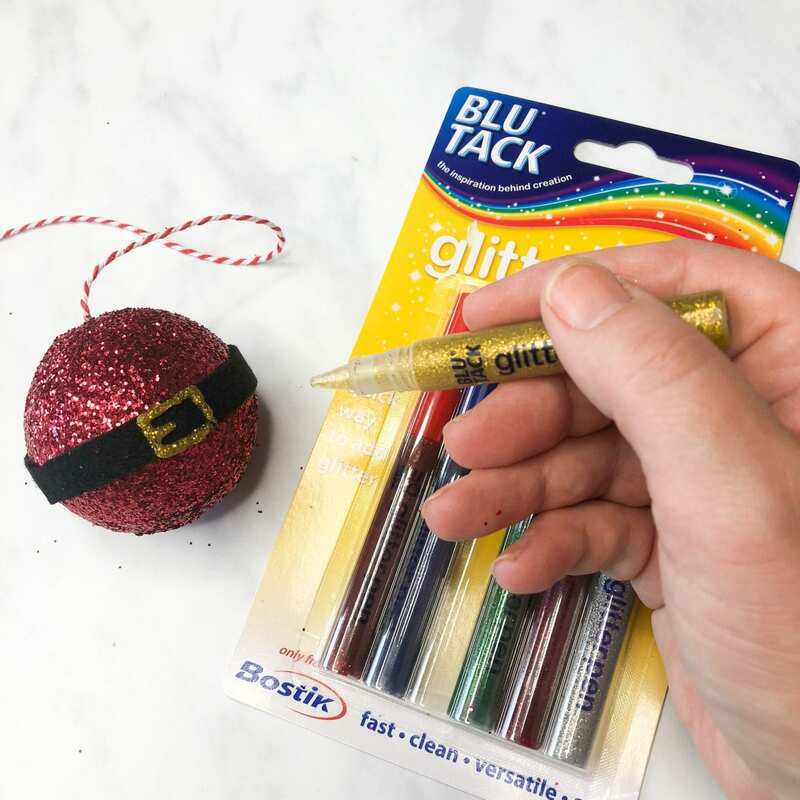 You can simply paint on a little more glue and apply some more glitter. When dry it is time to add the belt. 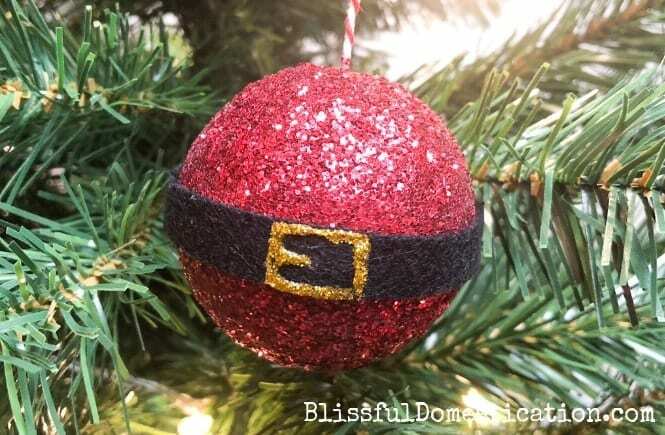 Cut a long strip of black felt and stick around the middle of the bauble. 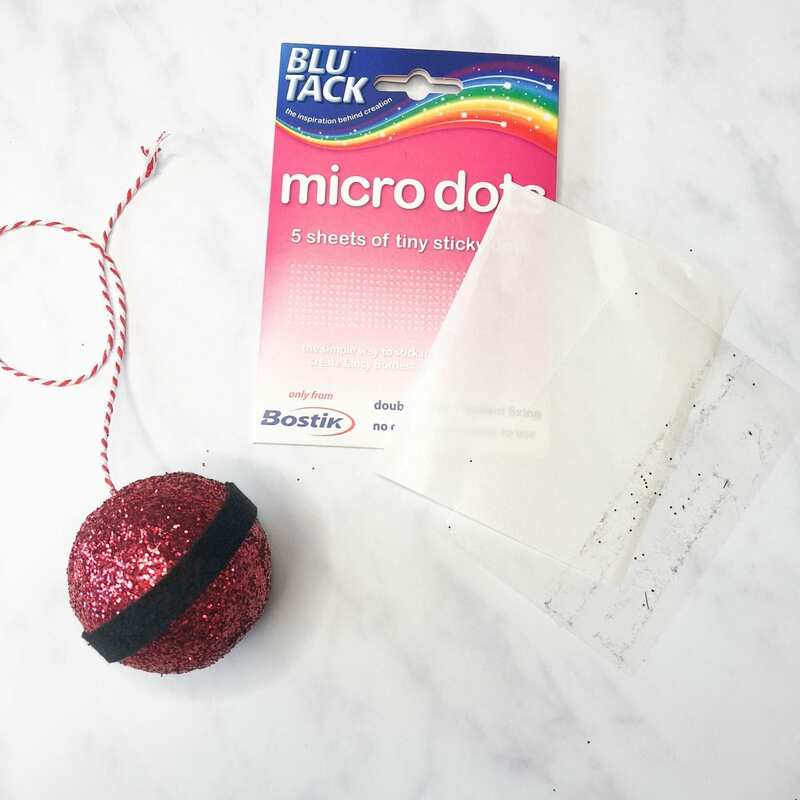 I used Bostik Micro Dots for this as they are so easy to use and mess free. They make anything, including my little felt strip, adhesive. Using a gold glitter pen, I added a buckle to Santa’s belt. 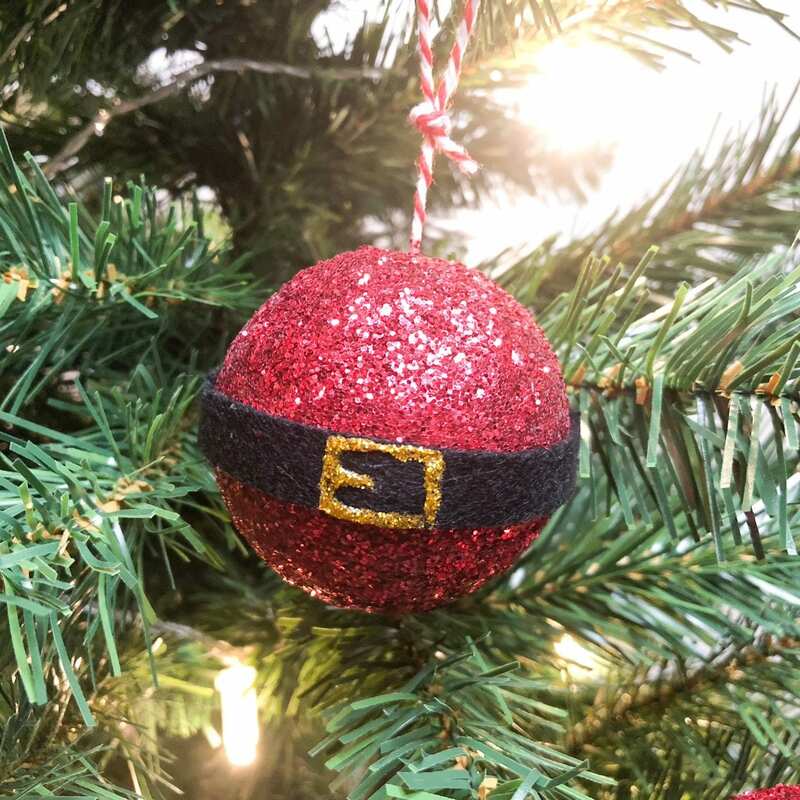 When completely dry, they are ready to hang on your tree! 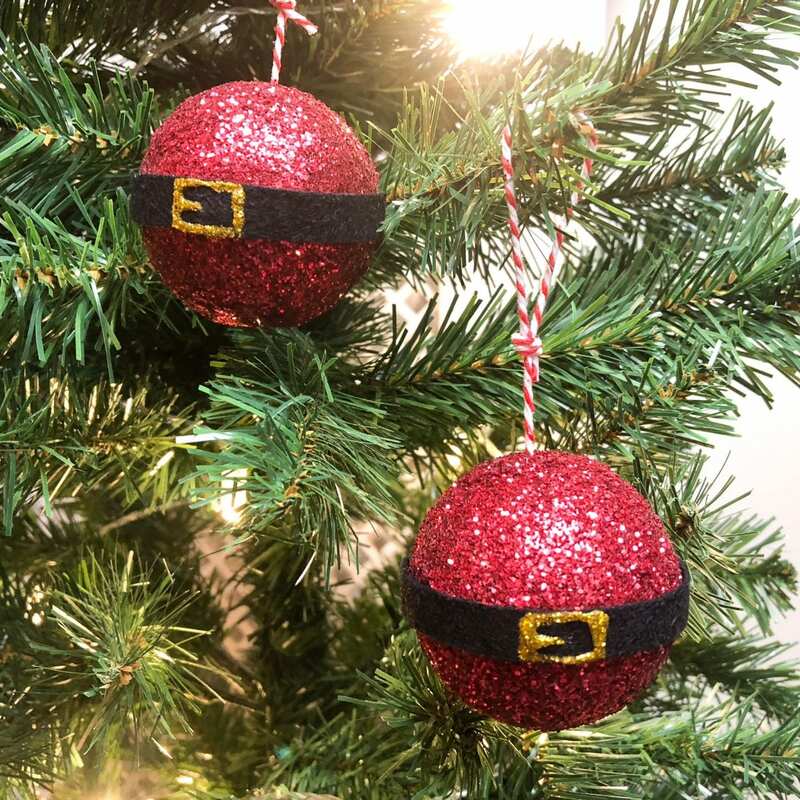 That’s it, super Simple Santa Baubles! What do you think of them? Using a similar method, we also made some glittery stars which are even easier to make, and we had so much fun making a little video of them. If you need some more inspiration for ‘Christmas Crafts’ then check out and follow our Pinterest board. They look great. My boys love anything with glitter will have to try them. Have added these to my shortlist for homemade teacher gifts this year!